The Prince of Wales visited Staffordshire on Tuesday 24 June to meet businesses in the region that are increasing sales by exporting. 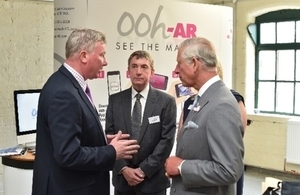 The Prince met six Small and Medium Enterprises (SMEs) at Middleport Pottery, Burslem, Stoke-on-Trent. Each company has received, or is about to receive, support from UKTI to help them export. Companies that export will generate an extra £30 billion for the UK economy. The Prince’s visit to Middleport also marked the completion of a £9 million project by The Prince’s Regeneration Trust to restore Britain’s last Victorian pottery and create a new hub for traditional crafts. UKTI arranged for the Prince of Wales to meet companies that are involved in international trade. I am delighted his Royal Highness has chosen to spotlight a group of top Staffordshire exporters and we have the opportunity to showcase these creative companies as a sample of some of the best the UK has to offer. The Prince of Wales visited the following companies who are linked by their creativity and commitment to international trade and currently export around the world. Manufacturers of fine bone china using traditional methods since 1875. With help from UKTI, Hudsons have been to China and visited trade exhibitions in Russia and more recently Japan. Exports now account for over 40% of total business revenue. A contemporary design–led, lighting sculpture company. Scabetti recently exhibited work in the ‘Limited Edition’ zone of Design Shanghai, China. The firm has completed UKTI’s Passport to Export and Gateway to Global Growth programmes. A British designer known for her bold, iconic and patriotic hand embroidered textiles and accessories, as well as home interior products. With the help of UKTI, the company has exported its products worldwide and is currently focusing on Europe and Japan. A collection of childrens’ bedroom furniture inspired by heritage vehicles and designs. The firm recently joined UKTI’s Passport to Export programme and is looking to expand into Europe and the USA. Provide augmented reality solutions to a wide range of customers. The firm will be joining the UKTI Passport to Export programme later this year. Contact your nearest UKTI office to find out how UKTI can help you expand overseas. The West Midlands continues to be the top region in England for overseas growth, according to the latest export figures from HMRC. Figures show it has the highest year-on-year percentage increase in exports in England. Annual exports are up from £23.3 billion to £27.8 billion, a 19.2% increase compared to last year’s figures. China remains the region’s top export market worth £1.2 billion this quarter. Businesses earn £100,000 on average in additional sales within 18 months of working with UKTI, so there is significant incentive for firms to seek out our help and I encourage businesses inspired by today’s visit to get in contact with us.